It’s a UNESCO world heritage site. It’s an ark of history, floating lazily on the waters of the Aegean Sea, just a few miles away from cosmopolitan Mykonos. It’s a chance to walk around the revival of the glory of the Greek civilization. It’s the head priest of the Cyclades, the birthplace of the immortals. It’s Delos. In the ancient times, the myth of god Apollo, god of light, and goddess Artemis having been born there rendered the island sacred: no mortal would ever be allowed to be born on its land. But, a cradle of gods as the island has been, no mortals would ever be allowed to die on it either. So, apart from it being a conspicuous religious and economic centre, the island had also been exclusive in that: even during the years of peak of the Delian Alliance, women on the brink of childbirth and people close to dying would be carried to the neighbouring island of Rineia. The whole of the known world of that age was aware of the sacredness of the island and of its uniqueness. 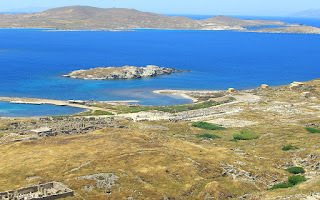 Nowadays, Delos reserves its uniqueness to the known world: nowhere else in the Globe is there a natural insular archaeological site of this size and importance. No other island on Earth hosts so many monumental antiquities from the Archaic, the Classical, and the Hellenistic periods, i.e. the centuries of the great Greek art, on a territory used exclusively as an archaeological site. 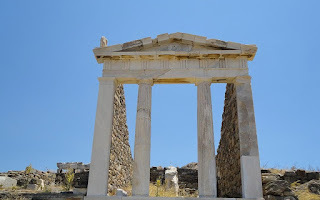 Delos is not a museum; Delos is not there to tell a story. Delos is history itself. Visitors coming from the neighbouring islands are not there on an educational trip; they have rather embarked on a lifetime experience. And, as if by magic, the sacredness of the island lives on: the multitudes of people, who flock to share the island’s uniqueness, can do nothing but just visit it. The archaeological experience is the one and only activity the island is about. Its enchanting landscape is home to nobody. History is thus repeating itself: in a place of such importance, no person is ever born or dies. 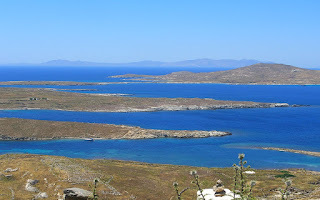 Brief synthesis Delos, even though a small (350.64 ha), rocky island in the centre of the Aegean Sea, was considered as “the most sacred of all islands” (Callimachus, 3rd century BC) in ancient Greek culture. According to the legend, it was there that Apollo-Sun, god of daylight, and his twin sister Artemis-Moon, goddess of night light, were born. The island was first settled in the third millennium BC. The Apollonian sanctuary, established at least since the 9th century BC, reached the peak of its glory during the Archaic and Classical period, when it acquired its Pan-Hellenic character. 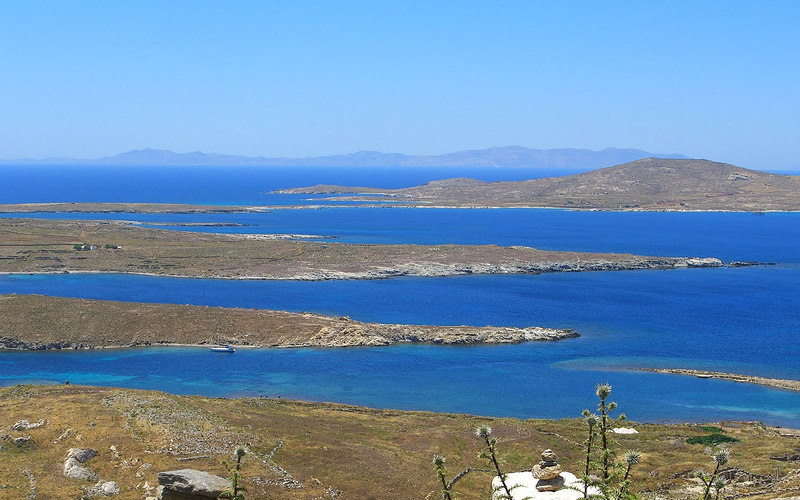 After 167 BC, as a result of the declaration of Delos as a free port, all the commercial activity of the eastern Mediterranean was concentrated on the isle. Rich merchants, bankers and ship-owners from all over the world settled there, attracting many builders, artists and craftsmen, who built for them luxurious houses, richly decorated with frescoes and mosaic floors. The small island became soon the maximum emporium totius orbisterrarium (S. P. Festus, 2nd century AD) – the greatest commercial centre of the whole world. The prosperity of the island and the friendly relations with the Romans were the main cause of its destruction. 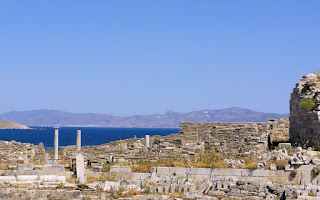 Delos was attacked and looted twice: in 88 BC by Mithridates, the King of Pontus, an enemy of the Romans, and later, in 69BC, by the pirates of Athenodorus, an ally of Mithridates. Since then, the island fell rapidly into decline and was gradually abandoned. Captured after its abandonment successively by the Byzantines, Slavs, Saracens, the Venetians, the Knights of St. John and the Ottomans, Delos was turned into a quarry site with its temple columns burnt for lime, and its houses left in ruins. The excavations that started in 1872 and are still in progress have unearthed the Sanctuary and a good part of the cosmopolitan Hellenistic town. The monuments that have been excavated up to now speak most eloquently for the grandeur of the sacred island and illuminate a past civilisation, which was Europe's cradle and wet nurse. The entire island is an archaeological site, which, along with the neighbouring islands of Rheneia, Greater and Lesser Rematiaris, constitutes an immense archaeological site. Delos had considerable influence on the development of architecture and monumental arts during the Greco-Roman period, as seen in the immense Hellenistic sanctuary. 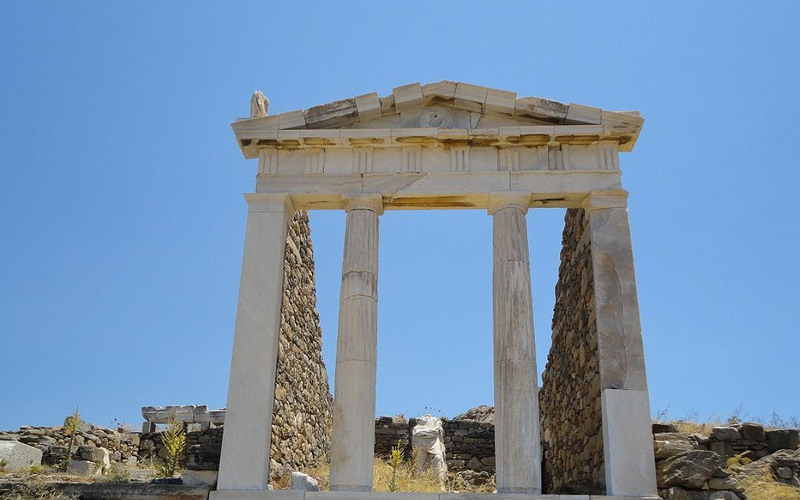 A great part of its treasure of masterpieces was found during the excavations and is exhibited today in Delos’ Museum. This influence was matched later by the important role it has played since the 15th century in furthering our knowledge of ancient Greek art from a widely renowned site, which is among the first sites in Greece that captured the attention of archaeologists and travelers. 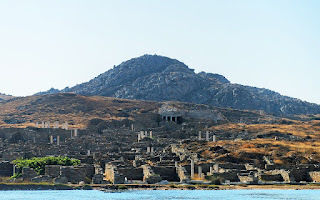 The island of Delos bears unique witness to the civilizations of the Aegean world since the 3rd millennium BC. During the Palaeo Christian era, it was the seat of the bishopric of the Cyclades. 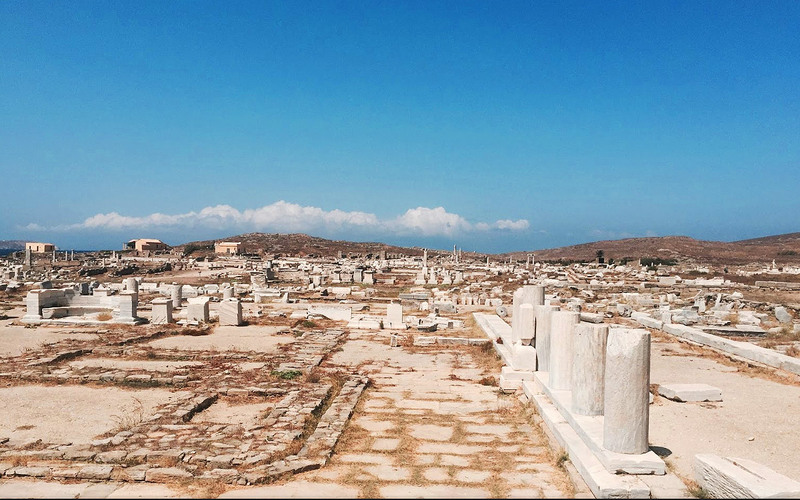 From the 7th century BC to the pillage by Athenodoros in 69 BC, the island of Delos was one of the principal Pan-Hellenic sanctuaries. The feast of the Delians, which was celebrated every four years in the month of May until 316 BC, included gymnastic, equestrian and musical competitions, Archaic Age dances, theatrical productions and banquets. Like the Olympic and the Pythic Games, it was one of the major events in the Greek world. The archaeological site of Delos provides an outstanding example of an architectural ensemble that restores the image of an extremely important cosmopolitan Mediterranean port that began to prosper since 314 BC, reaching outstanding levels during the 2nd and 1st centuries BC. Warehouses and trading companies abounded, large residential areas were established, public buildings were founded by associations of bankers, traders and ship-owners. Moreover, there were an unprecedented number of sanctuaries dedicated to foreign religions: temples of Sarapis, Isis and Anubis, temples to the Syrian gods Haadad and Atargatis, and even a synagogue in the stadium district. Delos is directly and tangibly associated with one of the principal myths of Hellenic civilisation. It was on this arid islet that Leto, made pregnant by Zeus and fleeing the vengeance of Hera, gave birth to Apollo and Artemis after a difficult labour. According to a Homeric hymn, the island, which until then had been floating, became anchored to the floor of the ocean. The newborn Phoebus - Apollo threw off his swaddling clothes, bathed the universe in light and began walking with his cither and his bow. Kynthos, the mountain of Zeus, and the wheel-shaped lake, close to which the pregnant Leto suffered labor pains for nine days and nights, remain essential landmarks of the island's sacred geography, which was clearly defined by the additions made to the Delian sanctuary to Apollo between the 6th and the 1st centuries BC. 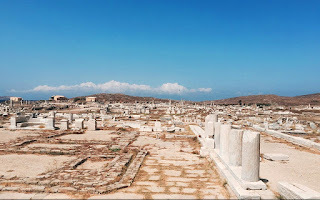 Delos was preserved through the centuries due to the fact that it remained uninhabited since the 7th century AD and due to its remote location. Nowadays, the entire island is designated as an archaeological site. The Hellenic Ministry of Culture, Education and Religious Affairs monitors the condition of the monuments and constantly provides for their protection, conservation, support and presentation. Therefore, the property not only maintains its integrity but also, through continuous works catering for its preservation, it constantly enhances and highlights the values for which it was designated a World Heritage site. 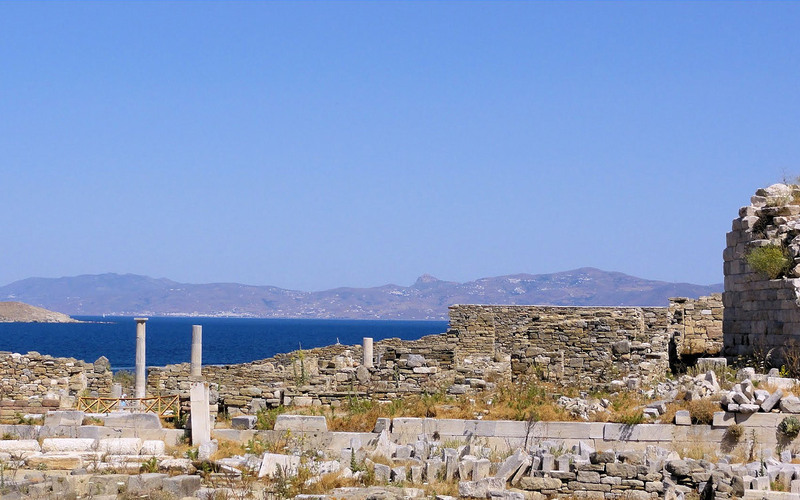 Among the major factors that affect the monuments of Delos are the strong north winds that dominate the central Aegean region and its proximity to the sea. The property receives over 100,000 visitors annually and any risks to the fragile landscape are mitigated. The authenticity of the site has not been challenged. The restoration work aims mostly to the preservation of the monuments in the state they were found during the excavations, while the methods and materials employed are compatible, discrete and reversible, in accordance to international standards. Therefore, there are no changes in the authentic character of the site during the last 130 years. The landscape also remains unaltered; not a village or a town was ever built over the ancient ruins. The only modern constructions on the island are the Museum, the refectory and a few small houses for the personnel, which were necessary for the functioning of the property as an archaeological site. 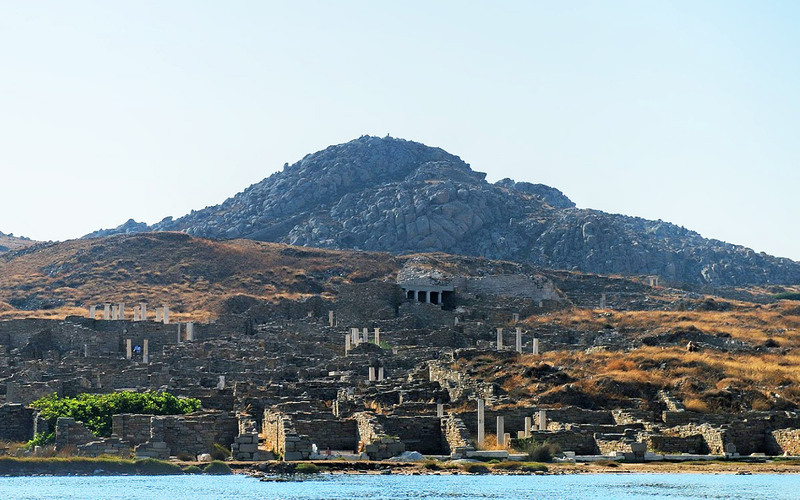 The entire island of Delos is an archaeological site, protected under the provisions of Law 3028/2002 “On the Protection of Antiquities and Cultural Heritage in general”. The Ministry of Culture, Education and Religious Affairs is the competent body supervising the site and overseeing all works carried out. The Ephorate of Antiquities of Cyclades, the competent Regional Service of the Ministry, is responsible for its management and protection. All the works carried out in the archaeological site are supervised by the Committee for the Conservation of the Monuments of Delos, a scientific body that plans, supervises and executes work programmesfor the conservation, support and restoration of the monuments, as well as for the presentation and protection of the property. Because of potential damage by the north wind, fragile marble sculptures, such as the Naxian Lions, were transported to the Museum and have been replaced with exact replicas. Moreover, research has been undertaken to investigate the structural materials of the ancient monuments, their origin and pathology. There are also ongoing studies for the overall conservation, support and presentation of the specific monuments. 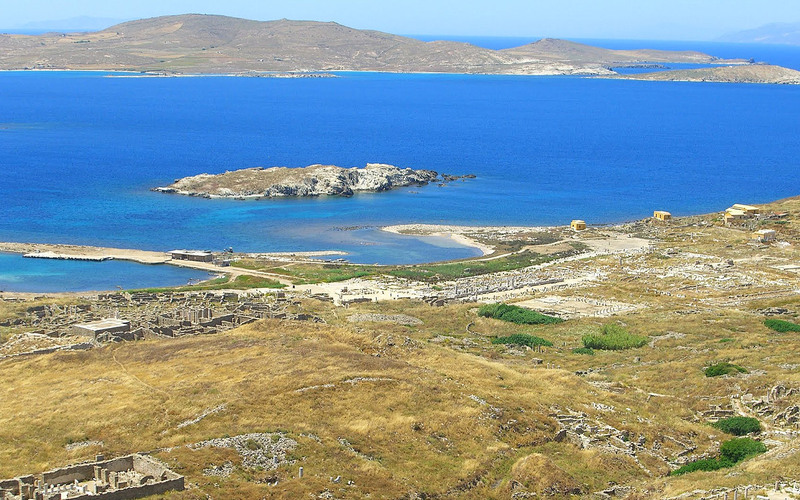 Many projects have been implemented on the vast archaeological site of Delos in recent years, with funding from the European Union and the Greek State. The aim of the works has been the conservation and consolidation of the monuments and the creation of visitors’ pathways, thus ensuring access to the entire archaeological site, especially for people with disabilities. Moreover, the works aspired to make the visit to the site truly instructive, meaningful and, of course, safe for monuments and visitors alike. Despite the major practical difficulties stemming from its remote location, which greatly exacerbates the conditions for the implementation of any kind of works, antiquity guards, archaeologists, conservators, architects and technicians reside on the island throughout the year carrying out important conservation, restoration and site-presentation work, gradually rendering the site accessible, more “legible”, comprehensible and friendly to the numerous visitors. However, renovation and refurbishment of the museum is deemed necessary in order to enhance visitors’ experience. Any risks to the fragile landscape and the ancient monuments that might arise by the increasing number of visitors are mitigated by the designation of specific itineraries and by the employment of temporary personnel during the high tourist season.